While on our Atlanta, Georgia family vacation we went to the Georgia Aqurium. 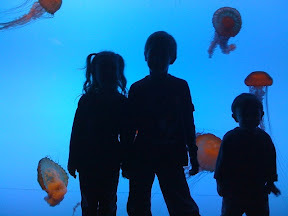 I must say that after hearing about the aquarium from so many people I was a little disappointed. Don't get me wrong, I thought it was a great aquarium. After all the build up there was nothing overly special or unique about it. With that said the beluga whales where gone for renovation. It was incredibly over priced. (They will not give you a military discount at the door. Instead to get the military price you must buy tickets on a near by military base.) We would not go back based on the price. They did have several touch pools that my kids loved. 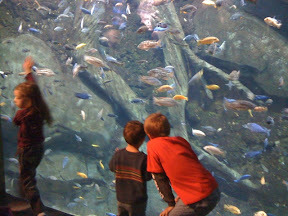 They got to touch sting rays, star fish, and a bunch of other stuff. 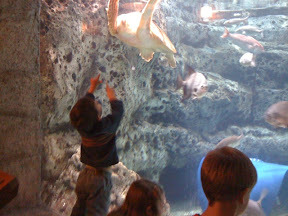 There were five areas with lots of various sea life to see. There was a dark area with lots of jellyfish. We were done with the main areas cover by regular admission with in two hours. 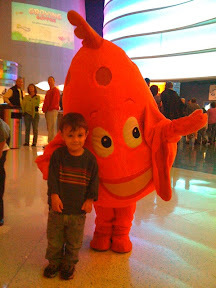 I hear from StressFreeBaby that a dolphin exhibit is on it's way in 2011! 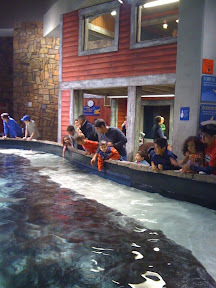 Other activities available with extra costs were a movie and shark exibit. You can park for free at any Disney resort, you just have to ask for the 3 hour parking pass! You can also park at Downtown Disney for free. Every night, beginning at 9 pm, the Electrical Water Pageant makes it's way around Seven Seas Lagoon and Bay Lake. It can be seen from 5 of the resorts. You could go to The Grand Floridian and then walk down to the beach and see the Pageant and the fireworks at Magic Kingdom. Disney's Boardwalk is located right outside Epcot and modeled after Atlantic City's boardwalk. Every night they play a Disney movie and have a campfire on the beach side. The kids can play in the sand while they watch the movie. Apparently if you are around when they do Illuminations at Epcot, you can see a lot of the fireworks and hear the music. (we will definitely do this, because when we where at Epcot, we could barely see!) Sometimes there is a magician there. You can also take a boat ride. Fort Wilderness Campground has a bonfire every night (around 8 pm) for free. It starts with a sing-a-long, Chip and Dale come for a meet and greet and then they play a Disney movie for free. You can bring items to make your own s'mores or you can buy it there. They also has a free petting zoo and you can visit the barn where they house the horses they use on Main Street. Small children can enjoy pony rides. Animal Kingdom Lodge has over 100 grazing animals on property. You can view them for free. There is a place set up for kids to play musical instruments from Africa inside the gift shop. The Gaylord Palms – My step mom said this was worth checking out! There is a large atrium with three destinations The Everglades which has REAL alligators, a Spanish Castle with pathways through the everglades and Key West – there is a large boat which is a bar inside the atrium. You do have to pay for parking however. While in Atlanta, Georgia on our family vacation we went out to Stone Mountain. It was twenty minutes outside of Atlanta. 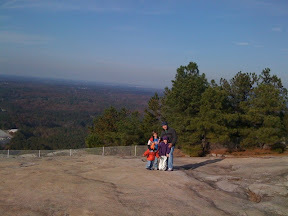 Our family had a wonderful experience at Stone Mountain and all of us highly recommend it. We went during a great time, because they had already started having Stone Mountain Christmas. 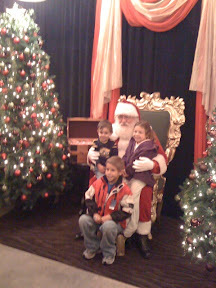 We knew we would be there late in order to meet Santa, so we went out there in the afternoon around 2 pm. 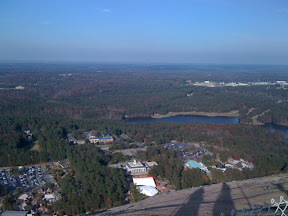 The first thing we did was ride a cable car up to the top of Stone mountain. This didn't take very long at all, but they sure cram people into the car. Once up there you can enjoy a great view. We could see all of Atlanta. Next we went to the Barn. Our kids loved it. 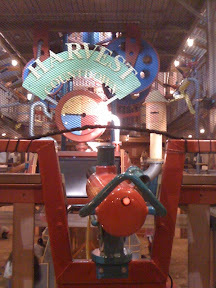 It is a four story barn with a challenge game in it. 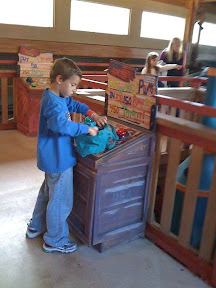 The kids collect 'fruit' different colored balls. Then they had to carry the fruits through the different levels and complete various challenges for points. 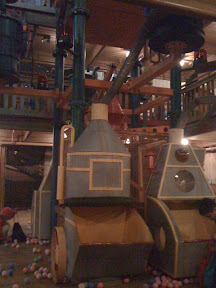 In the barn were tube slides that went from the fourth floor to the bottom floor and trampoline like floors! Other activities included: miniature golf, a welcome parade when Santa arrived, 4d Polar Express movie, meeting Santa and Mrs. Claus, fireworks, light show, train ride that stops and has a show in the middle, eateries and shopping.